As for this tent, it can be made of PVC tarpaulin or Oxford cloth. Material of PVC tarpaulin is more durable than Oxford, it's mesh reinforced, both sides PVC coated, UV-resistant, flame retardant. There are some rings on the bottom of tent for anchoring. Client can use some stakes to fix the tent on the ground firmly. Spider tent widely used for a variety of outdoor activities, such as outdoor campaign, wedding, summer party and other events. It's portable, easy carry and setting. 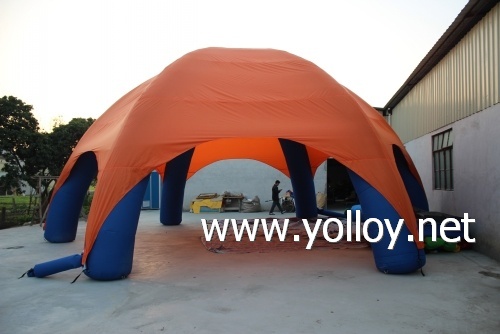 We can make the size from 4m diameter to 20m diameter. Here are some related products below for your reference, please check.